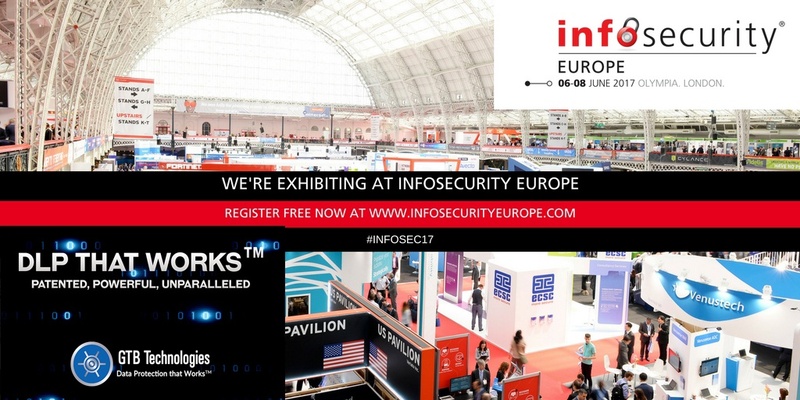 InfoSecurity Europe claims its’ the region's number one information security event featuring Europe's largest and most comprehensive conference programme and over 360 exhibitors showcasing the most relevant information security solutions and products to 13,500 visitors. Join GTB Technologies to see how our unique capability to visualize and control sensitive data is critical to an effective data protection / governance strategy. DO YOU HAVE DATA PROTECTION CONTROLS IN PLACE TO PROTECT SENSITIVE DATA ASSETS? ARE YOU READY FOR GDPR? Meet with a member of the DLP Expert team or Attend a Private Meeting to understand how GTB Customers are able to allow the flowing of ideas and collaboration from within their enterprise, through the cloud and social media; with the comfort that their sensitive, confidential data remains just that... confidential.